Whenever we travel, most of the time we have had our expensive stuff go missing on airports and we do not even come to know until we arrive at our destination. It takes only one dishonest person to steal the things. In some countries if you look local or at least speak their language well enough most places can feel quite welcoming, but once you are an outsider tourist, things can get sticky pretty quickly. But here is a solution to save you valuable stuff at airports from dishonest baggage handlers. I am sure this video will help you a lot and you will certainly like it. The person who made this video was motivated to make it because when last time he was returning from a long trip, he got his things missing from his locked suitcase. He gives us a demonstration that how such things happen at the airports, how dishonest people get into your suitcases and steal the things from out of it without unsealing it or without breaking the locks. You can see a red suitcase secured with a TSA lock. These locks are pretty common and easy to pick. But actually these kind of locks are a piece of garbage. These locks don’t secure your things. Anyone can easily get into your things even without opening it. 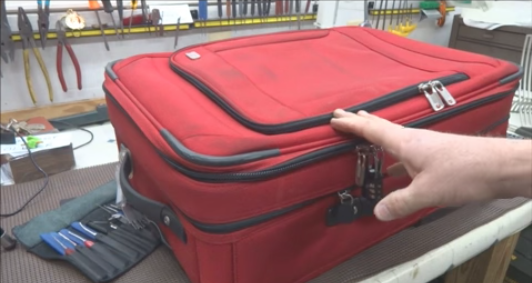 These locks can only prevent someone from opening the zip of your suitcase, but that does not mean that your stuff packed in the suitcase is secure. No, actually there is another way to open these kind of suitcases. Just move everything including zip handles and TSA lock to a side then take a ball point pen and simply put it on the seam and just disconnect the zipper. Now you can undo the entire suitcase and you can easily take the things out. Once you are finished with taking the things out, just close the suitcase and grab the original zipper and reseal the suitcase as it was before. The guy has shown another secure suitcase to travel with, which is not very easy to unlock without your permission. You can put any lock you want on it and if in case anyone at the airport wants to check your suitcase then you can provide them with the key, otherwise no body gonna check it and your stuff will remain safe. Thanks for watching this video and i hope you guys have liked it.